YOU drive for 4 laps with expert tuition along the way. This awesome off-road machine will get your heart pumping and give you an Adrenaline rush to remember! Fitted with a class-leading triple cylinder turbocharged engine that revs up to 10,000 rpm, it is capable of launching you zero from 0-100 km/hr in less than 5 seconds! Coupled with Fox racing shocks boasting over 500mm of wheel travel, this allows you to hit jumps flat out yet feel like you're in an arm chair upon your return to earth. 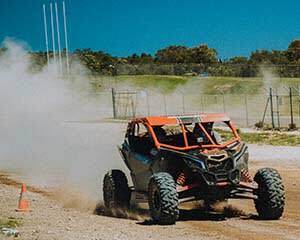 Due to the power to weight ratio, 4WD capability and short course track at Barbagallo Raceway, this is our most exhilarating drive. There is nowhere else you can experience the Can-Am Maverick X3. Definitely not for the faint-hearted!